This started in the 1980’s when the low molecular weight heparinoids (LWMH) first came out. Manufacturer’s said these products didn’t need therapeutic monitoring at first. Then we find out that was not necessarily true. The need to monitor was dependent on having an effective assay and was limited to “special” populations: renal subjects, obese and underweight, pediatric and spontaneous abortion patients and the presence of lupus anticoagulants. The laboratory had to come up with the anti-Xa chromogenic assay because the APTT which had been primarily used to monitor unfractionated heparin (UFH) was not sufficient to monitor the LMWHs accurately. Then we have the issue of the Direct Oral Anticoagulants (DOACs). The pharmaceutical industry has championed the need for no monitoring. Previously there were two coagulation assays used to monitor lab tests. PT initially as a ratio and then as INR to monitor Coumadin therapy. APTT to monitor UFH therapy. Chromogenic FX used to monitor direct thrombin inhibitors (DTIs) conversion back to Coumadin and for monitoring LA’s. Now anti IIa and anti-Xa inhibitors came along to replace the Vitamin K dependent oral medications. See Figure 1. So with the advent of the DOACs the lab has had to scramble to find tests to measure the levels in the case of treatment of VTEs in a variety of medical issues such as orthopedic surgery, atrial fibrillation, stroke and other acute and chronic conditions. Again the laboratory has had to develop new assays such as the ecarin assay, dilute thrombin, dilute Russell viper confirm method and calibrator specific anti-FXa chromogenic tests to validate the presence of the DOACs in patient plasma. The problem with this set of assays none of them have been FDA cleared yet for monitoring or measuring these medications. Everything is Research Use Only (RUO). Now in the last few years we again are faced with the situation of new components in the treatment of Hemophilia A (FVIII) and Hemophilia B (FIX) patients. Previously treatments for hemophiliacs had consisted of therapy with human derived or recombinant factors (r), use of bypass agents for subjects with or without inhibitors. The new rFVIII and rFIX have been produced by coupling rFVIII and rFIX with polyethylene glycol to give extended half-lives for these treatments both prophylactically and trauma. In the last few years now we have gene therapy for both disorders that shows great promise. Testing has typically been performed using one-stage specific clotting factor assays, chromogenic two stage methods, as well as global hemostasis procedures involving the thrombogram and thromboelastometry (TEG) and rotational elastometry (ROTEM). The different products have caused great confusion for the providers on what to order to monitor these medications. The laboratory is having issues in knowing what assays to use for each different medication. Different APTT reagent/instrument combinations give a wide variety of FVIII/FIX recovery levels. The FXa chromogenic assays are influenced by the use of human or bovine plasmas depending on the method. Both clottable and chromogenic methods need specific calibrators for each individual product being measured. There is to date no consensus on what to do when using these products and how to monitor them. A great education process is looming for treatment providers, the laboratory who provides the information they need to adequately treat the patients and the subjects themselves who have to self-medicate. In the following tables we have tried to get the latest information on the existing products and how the laboratory can assay the FVIII and FIX concentrations. Al-Samkari H, Croteau SE. Shifting Landscape of Hemophilia Therapy: Implications for Current Clinical Laboratory Coagulation Assays. Am J Hematol. 2018 Jun 8. Ljung RC. Prevention and Management of Bleeding Episodes in Children with Hemophilia. Pediatric Drugs (2018):20-464. Teichman J, Chaudhry HR, Sholzberg. Transfusion and Apheresis Science. (2018):480-484. Ling G, Nathwani AC, Tuddenham EG. Recent advances in developing specific therapies for haemophilia Br J Haematol 2018. 181:161-72. Kitchen S, Tiefenbacher S, Gosselin R. Factor Activity Assays for Monitoring Extended Half-Life FVIII and Factor IX Replacement Therapies. Semin Thromb Hemost 2017;43:331-337. Paxton A. Hemophilia drug interferes with APTT-based Assays. CAP Today September 2018. ADVATE Antihemophilic factor VIII (Recombinant) Factor VIII (FVIII) recombinant Monitor plasma Factor VIII activity levels by the one-stage clotting assay to confirm the adequate Factor VIII levels have been achieved and maintained. Perform the Bethesda assay to determine if Factor VIII inhibitor is present. If expected Factor VIII activity plasma levels are not attained, or if bleeding is not controlled with the expected dose of ADVATE, use Bethesda Units to titer inhibitors. According to multicenter field trials, all aPTT assays evaluated showed acceptable recovery in FVIII OSA (1,2). ADYNOVATE Antihemophilic factor VIII (Recombinant) FVIII pegylated recombinant Monitor plasma factor VIII activity by performing a validated one-stage clotting assay to confirm the adequate factor VIII levels have been achieved. Single Chain rVIII-SingleChain The chromogenic assay result most accurately reflects the clinical hemostatic potential of AFSTYLA and is preferred. The one-stage clotting assay result underestimates the Factor VIII activity level compared to the chromogenic assay result by approximately one-half. If the one-stage clotting assay is used, multiply the result by a conversion factor of 2 to determine the patient’s Factor VIII activity level…Monitor for the development of Factor VIII inhibitors. According to a multicenter field trial, all FVIII OSA showed underestimation by 0.5 vs. CSA, so use conversion factor of 2 to determine patient FVIII level (4). FVIII CSA unaffected. ALPHANATE SD Antihemophilic factor VIII/VWF Complex (Human) FVIII plasma derived Monitor for development of FVIII and VWF inhibitors. Perform assays to determine if FVIII and/or VWF inhibitor(s) are present. Monitor plasma levels of VWF:RCo and FVIII activities to avoid sustained excessive VWF and FVIII activity levels (greater than 150 IU/dL), which may increase the risk of thrombotic events. No available literature but package insert recommends FVIII OSA, vWF:Ag, vWF;RCo, along with inhibitor assays as needed. Accuracy by OSA was comparable to that of Advate, while marginally higher results observed for rFVIIIFc when using FVIII CSA (1). HEMLIBRA Emicizumab-kxwh bispecific factor IXa- and factor X-directed antibody …intrinsic pathway-based tests will yield overly shortened clotting times…overly shortened intrinsic clotting time will then disturb all single-factor assays based on aPTT, such as the one-stage FVIII activity assay; however, single factor assays utilizing chromogenic or immuno-based methods are unaffected by HEMLIBRA and may be used to monitor coagulation parameters during treatment…Assays containing human coagulation factors are responsive to HEMLIBRA but may overestimate the clinical hemostatic potential of HEMLIBRA. In contrast, assays containing bovine coagulation factors are insensitive to HEMLIBRA (no activity measured) and can be used to monitor endogenous or infused FVIII activity, or to measure anti-FVIII inhibitors… Emicizumab will not bind to bovine-based FVIII CSA kit components, so can use to monitor rFVIII in the presence of emicizumab if patient has breakthrough bleed, or use in CBA to measure inhibitor titer in presence of emicizumab. Emicizumab levels can be accurately monitored using FVIII CSA kits with human components as emicizumab binds to human proteins in the FVIII CSA kits; rFVIII effect will add to emicizumab effect if patient has breakthrough bleed requiring rFVIII infusion BUT presence of FVIII inhibitor could interfere with result. Emicizumab will shorten conventional aPTT in OSA, but 1:8 predilution in OSA using emicizumab calibrators and controls will allow for accurate level determination (6, 7, 8, 9, 10). HUMATE Antihemophilic factor VIII/VWF Complex (Human) FVIII plasma derived The Factor VIII levels of VWD patients receiving Humate-P should be monitored using standard coagulation tests, especially in cases of surgery. Strong consideration should also be given to monitoring VWF:RCo levels in VWD patients receiving Humate-P for the prevention of excessive bleeding during and after surgery. Monitor trough VWF:RCo and FVIII:C levels at least once daily in order to adjust the dosage. No available literature but package insert recommends FVIII OSA and vWF;RCo as needed. HEMOFIL Antihemophilic factor VIII (Human) FVIII plasma derived The presence of inhibitor can be demonstrated and quantified in terms of antihemophilic (AHF) units neutralized by each mL of plasma or by the total estimated plasma volume. If the inhibitor is at low levels (i.e. <10 Bethesda units per mL), after administration of sufficient AHF units to neutralize the inhibitor, additional AHF units will elicit the predicted response. No available literature but any available OSA should be accurate. JIVI Antihemophilic factor (recombinant), PEGylated, B-domain deleted Laboratories intending to measure the Factor VIII activity of Jivi should check their procedures for accuracy. For Jivi, select silica-based one-stage assays may underestimate the Factor VIII activity of Jivi in plasma samples; some reagents, e.g., with kaolin-based activators, have the potential for overestimation. Monitor the Factor VIII activity of Jivi in plasma using either a validated chromogenic substrate assay or a validated one-stage clotting assay. Use a validated CSA or OSA, but OSA with silica activators will underestimate levels, and OSA with kaolin activators will overestimate Jivi (11). KOGENATE Antihemophilic factor VIII (Recombinant) FVIII recombinant Monitor plasma factor VIII activity levels by the one-stage clotting assay to confirm the adequate factor VIII levels have been achieved and maintained, when clinically indicated…Monitor for development of factor VIII inhibitors. Perform assay to determine if factor VIII inhibitor is present. If expected factor VIII activity plasma levels are not attained or if bleeding is not controlled with the expected dose of Kogenate FS, use Bethesda Units (BU) to titer inhibitors. No available literature but package insert recommends FVIII OSA, along with inhibitor assay as needed. NOVOEIGHT Antihemophilic factor VIII (Recombinant) FVIII recombinant Monitor plasma factor VIII activity levels by the one-stage clotting assay or the chromogenic substrate assay to confirm that adequate factor VIII levels have been achieved and maintained. Perform assay to determine if factor VIII inhibitor is present if expected plasma factor VIII activity levels are not attained. Determine inhibitor levels in Bethesda Units. No available literature but package insert recommends FVIII OSA, FVIII CSA, along with inhibitor assay as needed. Perform one-stage clotting assay to confirm that adequate factor VIII levels have been achieved and maintained…Monitor the development of inhibitory antibodies to OBIZUR. Perform a Nijmegen Bethesda inhibitor assay if expected plasma factor VIII activity levels are not attained or if bleeding is not controlled with the expected dose of OBIZUR. According to multicenter field trials, all aPTT assays evaluated showed acceptable recovery in FVIII OSA (2). RECOMBINATE Antihemophilic factor VIII (Recombinant) FVIII recombinant Monitor plasma factor VIII activity levels by the one-stage clotting assay to confirm the adequate factor VIII levels have been achieved and maintained. Monitor for development of factor VIII inhibitors. Perform assay to determine if factor VIII inhibitor is present if expected factor VIII activity plasma levels are not attained, or if bleeding is not controlled. Use Bethesda Units to titer inhibitors. No available literature but package insert recommends FVIII OSA, along with inhibitor assay as needed. REFACTO Antihemophilic factor VIII (Recombinant) moroctocog alfa, FVIII recombinant, B-domain deleted Patients using ReFacto should be monitored for the development of factor VIII inhibitors. If expected factor VIII activity plasma levels are not attained, or if bleeding is not controlled with an appropriate dose, an assay should be performed to determine if a factor VIII inhibitor is present. If the inhibitor is present at levels less than 10 Bethesda Units per mL, administration of additional antihemophilic factor may neutralize the inhibitor. According to multicenter field trials, all FVIII OSA evaluated showed underestimation by 0.5 compared to CSA, so use conversion factor of 2 to determine patient FVIII level if using OSA (11). CSA unaffected (12). Monitor plasma factor VIII activity levels by the one-stage clotting assay to confirm that adequate factor VIII levels have been achieved. Monitor for development of factor VIII inhibitors. Perform assay to determine if factor VIII inhibitor is present when expected factor VIII activity plasma levels are not attained, or when bleeding is not controlled with the expected dose of XYNTHA. Use Bethesda Units to titer inhibitors. No available literature but package insert recommends FVIII OSA, along with inhibitor assays as needed. Lenting, et l Blood 2017;130(23)2463-2468; Hemilbra FDA Prescribing Information, 11/2017. Courtesy of Lab Corp (Special thanks to Dr. Dorothy Adcock and Dr. Stephen Tiefenbacher). See reference 12 Paxton A CAP Today 2018 above. ALPROLIX Antihemophilic factor IX (Recombinant) Factor IX (FIX) Fc fusion recombinant To confirm adequate Factor IX levels have been achieved and maintained, monitor patient plasma Factor IX levels by performing a validated one-stage clotting assay. Factor IX results can be affected by the type of aPTT reagent used. Measurement with a one-stage clotting assay using a kaolin-based aPTT reagent has been shown to result in an underestimation of Factor IX levels. Monitor for the development of Factor IX inhibitors if the expected Factor IX levels in patient plasma are not attained. Perform a Bethesda assay to determine if Factor IX inhibitors are present. Underestimation by 20 to 30 % with silica-based aPTT. Significant underestimation with Kaolin based aPTTs. BENEFIX BENEFIX® (nonacog alfa Coagulation factor IX (Recombinant) Factor IX recombinant Monitor patients for factor IX activity levels by the one-stage clotting assay to confirm that adequate factor IX levels have been achieved and maintained, when clinically indicated. 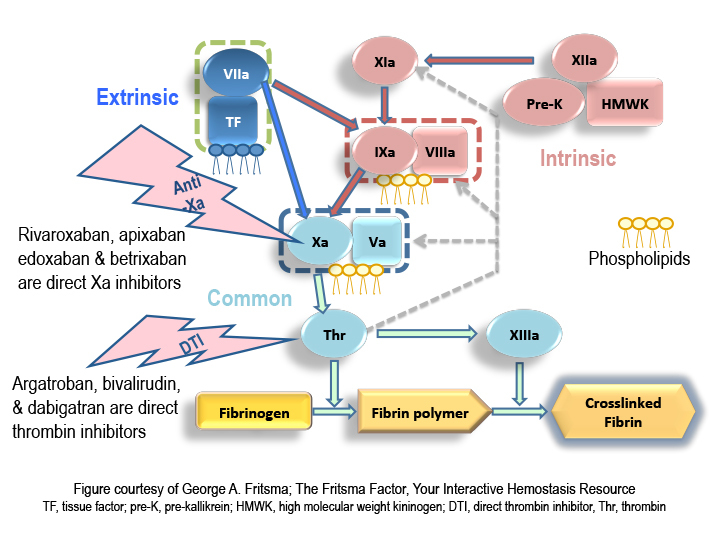 Monitor patients for the development of inhibitors if expected factor IX activity plasma levels are not attained, or if bleeding is not controlled with the recommended dose. FIX OSA acceptable. IDELVION Antihemophilic factor IX (Recombinant) FIX albumin fusion recombinant (rIX-FP) Monitor Factor IX plasma levels by a one-stage clotting assay to confirm that adequate Factor IX levels have been achieved and maintained. Factor IX activity assay results may vary with the type of activated partial thromboplastin time (aPTT) reagent used in the assay system. Kaolin-based aPTT reagents along with other reagents designed to exhibit low responsiveness to lupus anticoagulant have been shown to result in approximately 50% lower than expected recovery based on labeled potency. Overestimation of Factor IX activity in spiked samples of IDELVION (mean overestimation 32%) occurred at low Factor IX levels with commonly used aPTT reagents. Monitor patients for the development of inhibitors if expected Factor IX activity plasma levels are not attained, or if bleeding is not controlled with the recommended dose. Assays used to determine if a Factor IX inhibitor is present should be titered in Bethesda Units. Kaolin or silica-based OSA will likely result in an underestimation of activity level in FIX OSA. Only silica-based aPTTs were used in clinical trials involving FIX OSA (3). CSA probably unaffected. Polymorphism) If expected factor IX activity plasma levels are not attained, or if bleeding is not controlled as expected with the calculated dose, perform an assay that measures factor IX inhibitor concentration…Monitor patients for factor IX activity levels with the one-stage clotting assay to confirm that adequate factor IX levels have been achieved and maintained, when clinically indicated. Factor IX results can be affected by the type of aPTT reagent used FIX OSA acceptable but no publication available as to which activator is optimal; CSA probably unaffected. N9-GP (nonacog beta pegol) FIX pegylated recombinant The PEG moiety attached to the activation peptide of N9-GP interferes with the majority of the commonly used aPTT reagents, causing either under- or overestimation of the FIX activity level in the one-stage clotting assay. Most FIX OSA will be unsuitable for measuring, but the STA-Cephascreen and two different FIX CSA have been validated and shown to be accurate (13). RIXUBIS Nonacog gamma [coagulation factor IX (recombinant)]) Factor IX recombinant (CHO cell line) Monitor factor IX activity plasma levels by the one-stage clotting assay to confirm that adequate factor IX levels have been achieved and maintained…Monitor for the development of inhibitors if expected factor IX activity plasma levels are not attained. Factor IX potency results can be affected by the type of aPTT reagent and reference standard used in the assay; differences of up to 40% have been observed. FIX OSA acceptable but no publication available as to which activator is optimal; CSA probably unaffected. Sommer JM, et al. Comparative field study evaluating the activity of recombinant factor VIII Fc fusion protein in plasma samples at clinical haemostasis laboratories. Haemophilia. 2014;20(2):294-300. Turecek PL, et al. A world-wide survey and field study in clinical haemostasis laboratories to evaluate FVIII:C activity assay variability of ADYNOVATE and OBIZUR in comparison with ADVATE. Haemophilia. 2016 Nov;22(6):957-965. Pruthi R.K. Laboratory monitoring of new hemostatic agents for hemophilia. Semin Hematol. 2016; 53(1):28-34. St Ledger K, et al. International comparative field study evaluating the assay performance of AFSTYLA in plasma samples at clinical hemostasis laboratories. J Thromb Haemost. 2018 Mar;16(3):555-564. Frampton JE, et al. Efmoroctocog Alfa: A Review in Haemophilia A. Drugs. 2016;76(13):1281-1291. Church N, Leong L, Katterle Y, Ulbrich HF, Noerenberg I, Kitchen S, Michaels LA. Factor VIII activity of BAY 94-9027 is accurately measured with most commonly used assays: Results from an international laboratory study. Haemophilia. 2018 Sep;24(5):823-832. Mikaelsson M, Oswaldsson U, Jankowski MA. Measurement of factor VIII activity of B-domain deleted recombinant factor VIII. Semin Hematol. 2001 Apr;38(2 Suppl 4):13-23. Peyvandi F, Oldenburg J, Friedman KD. A critical appraisal of one-stage and chromogenic assays of factor VIII activity. J Thromb Haemost. 2016 Feb;14(2):248-61. Tiefenbacher S, et al. Qualification of a select one-stage activated partial thromboplastin time-based clotting assay and two chromogenic assays for the post-administration monitoring of nonacog beta pegol. J Thromb Haemost. 2017 Oct;15(10):1901-1912. Rangarahan, M.B, Walsh L, Will L et al: AAV5-Factor VIII Gene Transfer in Severe Hemophilia A. NEJM 2017. 377:2519-2530. Gene therapy is not currently approved for use in North America for therapy for Hemophilia A or Hemophilia B. The investigational gene therapy named valoctogene roroxaparvovec (RV) an adeno-associated virus serotype 5 (AAV5) vector containing the B-domain-deleted F8 gene (AAV5-VIII) showed the ability to increase levels for FVIII in a dramatic manner. In a study discussed in an article in Medscape 12/10/2018 the author AM Castellino, PhD remarked that 11of the 13 patients who were enrolled in the study, 11 had their FVIII levels rise to near-normal or normal FVIII levels. The gene replaces the gene missing in Hemophilia A. This article was published in Reference #19 listed above and simultaneously reported in ASH 2017. It was reported that the clinical data for this investigational gene therapy exceeded the expectations of the research group in terms of increasing Factor VIII levels and reducing the number of bleeding rates annually. This therapy would do away with the subjects who suffer from this disorder from having to daily infuse themselves to stop the issue of reoccurring bleeds over long periods of time. In a press conference at ASH 2017 meeting, it was reported on the efficacy results with AAV5-VIII for two groups with severe Hemohilia A. Seven subjects received 6 X 1013 vector genomes (vg/kg) and 6 participants were administered 4 X 1013 vg/kg. Each group received one dose injection of VR. The higher dose subject also were given a prophylactic corticosteroid after one subject having elevated ALT levels 1.5 times above baseline. The lower dose subjected had no steroids administered. At the lower dose, the median FVIII levels rose toward the normal range. At week 20 it was 20 IU/dl, and at week 32 the median level was 51 IU/dl. All testing was performed using one-stage clotting factor assays and two stage FXa chromogenic assays for this study. Basically if further studies in Phase III Clinical trials holds up this will be a significant improvement to what is currently standard of care. I hope that you will find this information some assistance in this new and sometimes confusing new world of laboratory “Catch-up” to the new medications for treating patients with the Hemophilia disorder.